Ah, those lovable robots, androids, and cyborgs, performing plenty of chores and dangerous jobs so us humans can remain out of harm’s way. But…What happens when something goes wrong? If your computer has a hardware fault, would it kill you in your sleep? Would your microwave turn on only when it was opened? What about robots living a life of crime, Asimov’s 3 Laws of Robotics be damned? The only real requirements for this anthology will be that a major character must be mechanical or electronic in nature and they’re doing something nefarious. All submitted stories must have a dark undertone to qualify for the HWA. Humor is welcome, as long as something is causing some harm or damage to those pesky “organics”. Stories must be 5,000 words to 10,000 words. Query for longer, shorter stories will not be entertained. Tortured, maybe, but that’s a hard minimum. Modified Shunn format (see blind reading note): (Times New Roman 12pt font; .docx/.doc/.rtf formats only; single paragraph spacing; one space after a period; do not use tabs to indent; American quote mark usage; both American and UK English acceptable.) No reading fee. BLIND READING RULES: These will be read blind, so put your name, address, phone, email(s), and a 100-200 word bio on a cover page and do not put any identifying information on the rest of the manuscript. Include a running page count starting with page #2 (cover page will be #1). Payment on publication, scheduled for first quarter 2019. No simultaneous submissions, acceptances will be on a rolling basis until December 15, 2018, when all acceptances should be finalized. A paper copy will be produced first, with a Kindle version planned afterwards. Contact Annik . Valkanberg @ ascarystory . com with any questions or cannot submit via Submittable. This project is designed to be a qualifying market for the Horror Writers Association, paying $25 per accepted story and a digital copy when it is produced to allow folks to join or move up to the Affiliate level of HWA membership. Authors will be able to purchase books at a 40% discount from cover price + shipping. This anthology will feature some original artwork from several artists. We will be using several new production methods with this anthology, including switching over to Ingram LightningSource. To submit, go to: https://villainouspress.submittable.com/submit or email Annik. Report submissions to The Submissions Grinder and Duotrope. Transitional work is in progress on moving all titles from CreateSpace to IngramSpark and Ingram LightningSource. Since CreateSpace is going away and will be absorbed by Amazon’s KDP system, we felt it to be in our best interest to diversify our printing and distribution. In the past we have had excellent results when contacting CreateSpace to correct any issues. Unfortunately, KDP has made multiple errors and odd demands including for one author to have a contract with himself to publish his own book under his own name. We have no trust in the KDP system so we will just use them to sell Kindle and Amazon hard copies of our books in print. Ingram will handle all other hard copy outlets including Barnes & Noble, Books-a-Million, Powell’s, and any bookstore near you. 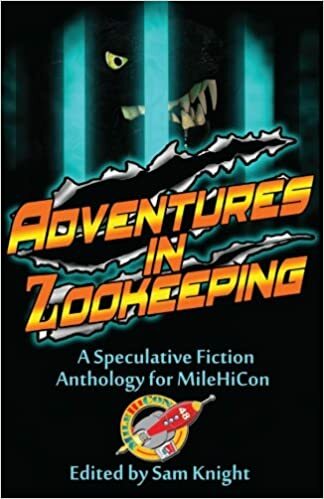 Adventures in Zookeeping, an anthology that will support MileHiCon Denver with the net proceeds, will be released on October 28, 2016 at MileHiCon. At MileHiCon 47, several authors, publishers, and editors headed a panel called So You Want to Be in an Anthology? The audience selected the theme for the anthology, and only the people who attended the panel were eligible to submit short stories for publication. The authors would experience having their manuscript run through the editing process and receiving a contract, which included notes about what to watch out for when reading a contract. The stories in the anthology will be copyrighted in the author’s name. All proceeds beyond actual costs will go to support MileHiCon. Don’t forget, MileHiCon 48 will be held in Denver on October 28-30, 2016. There will not be an anthology for 2017. From the Classic Horror Series. For those who love the weird and mysterious, this novel will bring a creepy thrill. Roger Locke, successful composer, buys a Connecticut farm. On the first night after he moves in, he is startled by two nocturnal visitors: one a “thing of dread” and the other apparently bent on saving his life from it. Up to the very last the suspense is sustained without a break, until in a sudden flash the whole astounding truth is revealed. The reader may take their choice of either an occult or scientific explanation of the matter. Available in paperback from Amazon, Barnes & Noble. Sidekicks, an anthology that will support MileHiCon Denver with the net proceeds, will be released on October 23, 2015 at MileHiCon. At MileHiCon 46, several authors, publishers, and editors headed a panel called So You Want to Be in an Anthology? The audience selected the theme for the anthology, and only the people who attended the panel were eligible to submit short stories for publication. The authors would experience having their manuscript run through the editing process and receiving a contract, which included notes about what to watch out for when reading a contract. The stories in the anthology will be copyrighted in the author’s name. Originally, the contributors were to receive an ebook version, but the principles decided to switch it to a physical copy so the contributors could sign each other’s copy at MileHiCon 47. The authors will also be able to pick up additional copies at a discount should they decide to pick up books for selling at a convention or for Christmas presents. Don’t forget, MileHiCon 47 will be held in Denver on October 23-25, 2015. We will be running another panel for the 2016 anthology on Saturday, October 24th in the Mesa Verde B room at noon. You must be in attendance and sign the attendance sheet to have the opportunity to contribute to next year’s anthology. The anthology STEAMPUNK: The Other Worlds will officially debut at AnomalyCon in Denver, Colorado on March 28, 2015. Edited by Sam Knight, senior editor at Villainous Press, this collection of steampunk-themed stories go beyond the typical boring Victorian earth-based confines. Cover designed by Peter J. Wacks. Available on Amazon on March 30, 2015. Listed in Bowker’s Books in Print database and available from any reputable book dealer. This book will debut at AnomalyCon in Denver, CO.
One of the things a small press needs is to have a brand. Examples of branding include the use of logos, such as our dapper Villainous Press villain with a top hat. This logo was designed by artist Chaz Kemp, who is available for cover and logo designs. He also works on graphic novels, using a unique renaissance-inspired framing that stands out from the usual fare. His rates are reasonable, and we have always been overjoyed at the work he produced for us. Another way for a small press to brand is to use a special interior template for print books. Villainous Press uses a modified interior template designed by Quincy J. Allen over at RuneWright.com. All of our print books are designed for ease of reading. When you purchase a new Villainous Press book, you know exactly how the interior will look. When readers know they will always be able to enjoy a well-designed book no matter which title they choose, that becomes part of your branding. If you’re a small press or an author venturing out into the world of self-publishing, we highly recommend you use a standard print template that shows your interiors are well-designed and are quality works. If you’re a Microsoft Word guru, you can make your own detailed template, or you can contact Quincy at Runewrite. His rates are very reasonable, and once you have your template set, every book you publish will be professionally laid out and beautiful in your hands. The charity anthology Freakend Madness was released on February 1, 2015. Edited by Villainous Press Senior Editor Sam Knight, with an afterword by Bram Stoker Award® Finalist Guy Anthony De Marco, this book will benefit Asbury House, a battered woman’s shelter in Fort Collins, Colorado. The original idea for this anthology came about from a bored author stuck in a hotel room. He put out a challenge to write a dark story in a single weekend. Many answered the call, but only a handful followed through. When the original author became unable to assemble the final stories into a finished anthology, Villainous Press was asked to take over the project. For many of the authors, this was a chance to go through a full editing experience and to receive some training on manuscripts and contracts. Freakend Madness will be a recurring charity anthology series to help new authors get published alongside their more experienced peers. Editor Guy Anthony De Marco selected a wide range of author styles for this volume. This is the third volume of an ongoing series of eerie horror and ghost stories. Look for additional volumes of Ancient Terrors in January 2014. Editor Guy Anthony De Marco selected a wide range of atmospheric stories for this volume. This is the second volume of an ongoing series of eerie horror and ghost stories. Look for additional volumes of Ancient Terrors in December 2013.